Lofts are intriguing spaces when it comes to universal design. Their characteristic open-plan layout makes them supremely accessible – minimum walls and doorways to present barriers to getting around. Many of the homes featured in my book The Accessible Home: Designing for All Ages and Abilities resemble lofts on the inside, even if they look no different from their neighbors on the outside. To see how this works, let’s look more carefully at an actual loft. 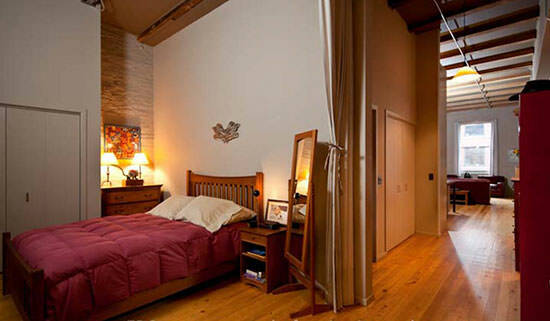 This home in downtown Seattle is located in an older industrial building that has been converted to artist lofts. At only 986 sq. ft, the space would seem small for most active and sociable adults, let alone a couple where one person uses a manual wheelchair. The space is like a shoebox—long and narrow, with a door at one small end and windows at the other. Fortunately, high ceilings and brick walls give the area a real sense of being both sturdy and even quite airy, at the same time. Part of the design challenge was to maximize what little daylight comes in through two average-sized windows. Architect Carol Sundstrom chose to avoid interior walls in the living, dining, and kitchen areas. As a result, these rooms all feel spacious! The windows and view can be seen throughout the shared living areas, and the furniture layout has total flexibility—the homeowners can easily pull the table away from the wall for a large dinner party or skootch upholstered chairs towards each other for an intimate gathering. 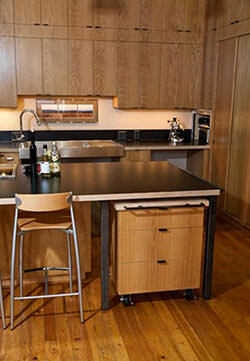 The compact kitchen appears very generous due to an L-shaped layout with a large island countertop. Cabinets run full height on two walls, leaving the island free to double as both a cozy breakfast center and also a generous serving counter. And when it is just the homeowners cooking together, they can face each other or keep track of the weather outside the windows. One area that doesn’t need daylight is the bedroom, located beside the loft entrance off the building’s common-use hallway. By using a curtain to define the sleeping area, the architect creates flexibility where it is most needed. With the curtain open, the apartment entrance expands to welcome guests, and makes the bedroom area larger when it is just the couple at home together. Pulled shut, the curtain makes the bedroom a private space and defines the entrance as a proper mudroom. The bathroom is the only room that really needs walls, and placing it in the center of the loft means that by constructing one room, the design actually creates three! A small laundry closet backs up to the bathroom wall, ready for service from either shared living spaces or the sleeping area. The hallway that links living areas in the loft morphs into a laundry room when the closet doors are open. When dealing with a small living area, these types of spatial economies aren’t just clever, they actually seem to enlarge the living space. 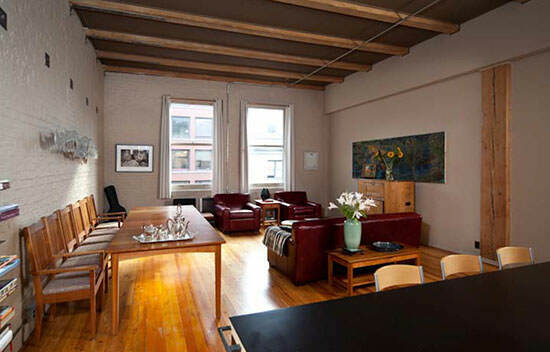 Open yet compact, specific yet adaptable—these are the lessons of loft design!